66 PERFECTLY LOCATED GEM IN P.V. 9016 North 60th Street, Paradise Valley Located on one of the best streets in Paradise Valley, this sharp and move-in ready home has a great floor plan; an open, remodeled kitchen with a center island, beautiful cabinetry, the best appliances - including a built-in Miele for morning coffee, family room and fireplace, formal and casual dining spaces, vaulted beamed ceilings, a formal living room accented with bay windows, a huge game room looking out to a terrific backyard with a pool and barbecue ramada. The first master suite has sitting area with a fireplace, generous bath area and a huge closet. There is also a second master/guest suite. Wood and stone floors throughout. The whole interior of house is freshly painted and a new roof was completed this month. Great parking and garage space compliment the super location and dramatic mountain views. A real gem! 4BR | 3.5BA | 6,199 SQ FT $1,675,000 | MLS# 5609146 Catherine Jacobson 602.790.1992 3BR | 4BA | 3,307 SQ FT $1,685,000 | COMING SOON Catherine Jacobson 602.790.1992 4BR | 4BA | 2,969 SQ FT $1,495,000 | Private Inventory Catherine Jacobson 602.790.1992 PERFECT SANCTUARY IN MOUNTAIN SHADOWS 5525 E. Lincoln Dr #79, Paradise Valley Beautifully remodeled, this home features dramatic Camelback Mountain views from a prime location along the golf course in guard-gated Mountain Shadows. Inside, the great room has a vaulted ceiling and fireplace, perfect for entertaining. The kitchen was updated with maple cabinetry and granite counter tops and features a walkin pantry. The master suite has vaulted ceilings, double vanity sinks, shower and separate soaking bath. Outside, a fabulous flagstone patio with a heated pool, spa, fireplace, and built-in barbecue is perfect for entertaining amidst those golf course and Camelback views. Garage parking for four cars completes this immaculate home. 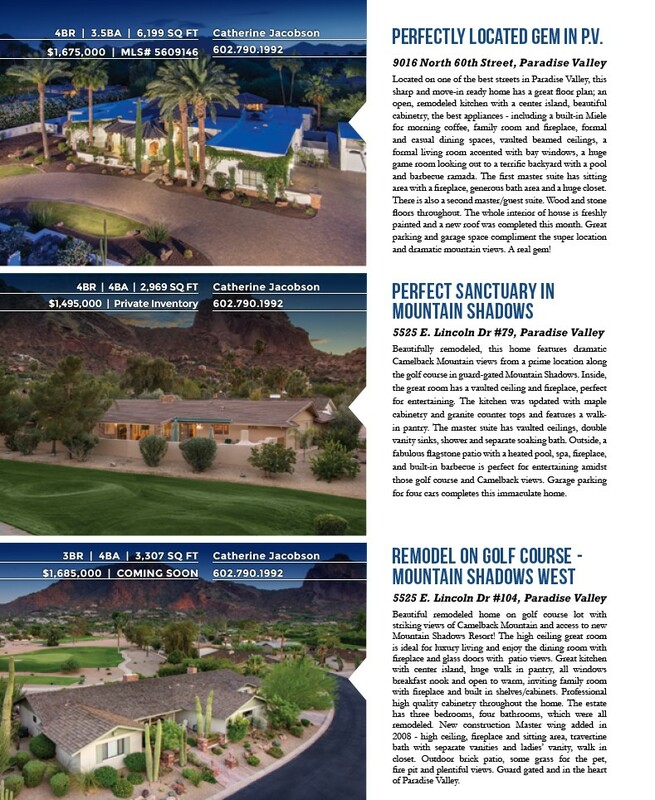 REMODEL ON GOLF COURSE - MOUNTAIN SHADOWS WEST 5525 E. Lincoln Dr #104, Paradise Valley Beautiful remodeled home on golf course lot with striking views of Camelback Mountain and access to new Mountain Shadows Resort! The high ceiling great room is ideal for luxury living and enjoy the dining room with fireplace and glass doors with patio views. Great kitchen with center island, huge walk in pantry, all windows breakfast nook and open to warm, inviting family room with fireplace and built in shelves/cabinets. Professional high quality cabinetry throughout the home. The estate has three bedrooms, four bathrooms, which were all remodeled. New construction Master wing added in 2008 - high ceiling, fireplace and sitting area, travertine bath with separate vanities and ladies’ vanity, walk in closet. Outdoor brick patio, some grass for the pet, fire pit and plentiful views. Guard gated and in the heart of Paradise Valley.